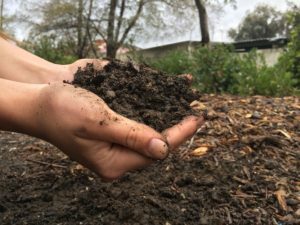 Research shows that nutrient-rich runoff from lawns can cause excess algae growth in streams, lakes, and estuaries, while pesticide runoff can contaminate drinking water supplies with chemicals toxic to both humans and aquatic organisms. (Source: EPA). All fertilizers and pesticides, as well as gas and oil for machinery, should be stored in appropriate containers that don’t leak. Any excess chemical spills should be swept up immediately. 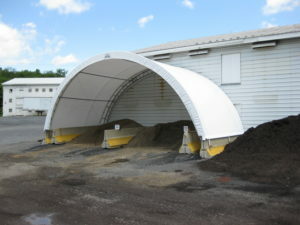 Store all containers holding powder and liquid materials under cover to protect from rain and snow. Always keep containers closed and secure. Store soil and mulch piles in contained areas where they cannot be washed into the storm drainage system. When these materials are transported for use on site, store them on the lot and out of the street where they won’t be washed into the street and storm drain system with overspray from irrigation or stormwater. Whenever possible, use chemical alternatives, or low-toxic chemicals. Use the smallest amount necessary. 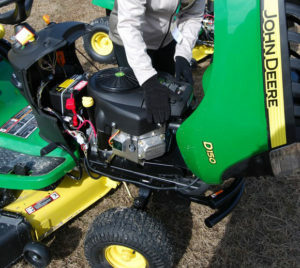 Inspect vehicles and equipment for leaks regularly. Fix problems as soon as possible. When draining fluids, use a drip pan and/or funnel to prevent any spills. Keep a cleanup kit of safety equipment and absorbent material, such as kitty litter or sand for spills. Never hose down streets or sidewalks to clean. Use a broom and properly dispose of sweepings. 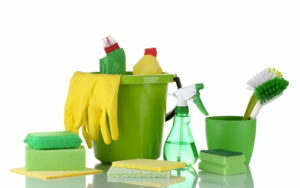 Whenever possible, purchase water based cleaning products. Look for products labeled “non-toxic,” “non-petroleum based,” “ammonia-free,” “phosphate-free,” and/or “readily biodegradable". Dispose of unused portions properly.